Excellent condition. Authentic Gucci Bardot Crystal Gold Tote Bag. Excellent condition. Authentic Gucci Black Plain Leather Horizontal Handbag. Unused. 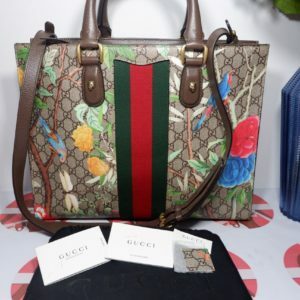 Authentic Gucci Blooms Blue Floral/ Red leather trims two way Bag. Brand new. Authentic Gucci Blooms Pink Backpack.